Marketing campaigns (“CRM » Marketing » Campaigns”) are a great way to organize a combination of advertising or communication events. It is possible to link tracking codes, promotions, prices, and sales opportunities directly to them. 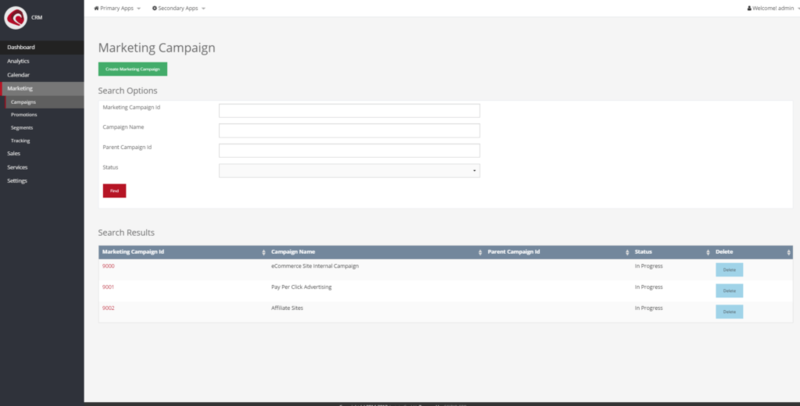 The campaign screen allows the creation or editing of existing campaigns. The possibilities are sheer limitless. The system itself differentiates between “promotions” and “promo codes”, whereas the latter requires the user to enter a specific code for a promotion to apply. As can be seen, the combination of conditions is already quite extensive and more-conditions can be added to the database. Promos can further be limited to specific stores (“Stores”) for a limited amount of time (until date) and feature specific content, that can get displayed alongside the general description within the web-store. Segments (“CRM » Marketing » Segments”) can be used to group customers (sales) or regional sales (markets) into groups, so that it is easier to draw conclusions for marketing efforts. A good example would be a set of user-groups, where we group customers based on their age, gender, location or perhaps even a shared history. Another example, could be the sales of a company in europe, or on the caribic islands. Regardless of the type, both segments always require a segment name and a short description. Both can be applied to specific stores, so it is easier to differentiate the sales later. Tracking codes (“CRM » Marketing » Tracking”) are used to identify parties based on referencing websites. A special processor is run on each request, which checks for promo-codes and then adds the value to the existing party. If the user isn’t authenticated, the promo-code will be stored in session, until he is either authenticated, or creates an anonymous order. In both cases the tracking codes are stored in the order – alongside to the user information.